The "hand lens" or "folding pocket magnifier" is one of the basic tools used by almost every geologist. Geologists working in the field, lab, or office often need to closely examine rocks, sediments, soils, sand, minerals, and other materials with tiny features. A hand lens provides a quick and easy way to perform that work. It is important for them to examine the rock closely to identify minerals, see the size and shape of grains, look for small fossils or crystals, confirm the results of a hardness test, and much more. Many field geologists use a hand lens so frequently that they wear it on a lanyard or cord around their neck. Some tuck the lens into their button-down shirt pocket when it is not in use. The rock hammer, hand lens, camera, topographic map, field notebook, and Brunton compass are the most basic tools of a field geologist. 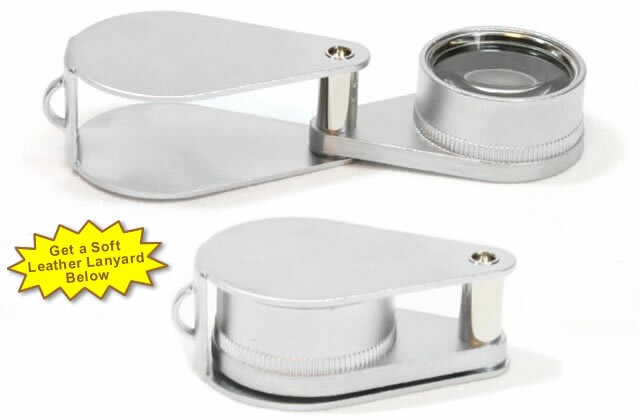 This handlens is a 10x pocket magnifying glass with a durable metal case. When not in use, the lens folds into a protected position. This protects the lens from breakage and scratches. It has a metal loop for attaching a lanyard, or you can thread a cord through the case below the pivot hinge and tie a knot. Get one for the field and one for your desk! Approximate measurements: 3 1/8" unfolded length, 1 7/8" folded length, with a lens diameter of 7/8". What's the difference between a "hand lens" and a "loupe"? "Hand lens" and "loupe" are two different words used for the same tool. Geologists and others who wear them on a lanyard and use them in the field seem to prefer the name "hand lens." Gemologists and others who keep them in a leather case and use them in labs, stores, and offices seem to prefer the name "loupe." This 10x loupe by Krüss is smaller than the hand lens above and is more convenient to carry in its leather case. This pocket-size loupe and leather case by A. Krüss Optronic is a convenient way to carry a small magnifier in your pocket, backpack, purse, or vehicle. It is also a protected way to store a lens in a desk drawer or bookcase. It provides 10x magnification, which has many uses in geology, gemology, jewelry inspection, biology, printing, meteoritics, chemistry, coin/stamp collecting and more. Approximate measurements: 2 1/8" unfolded length, 1 1/4" folded length, with a lens diameter of 5/8". The Gfeller leather lanyard has a multitude of uses. It is the perfect way to carry a hand lens around your neck. Some people use the lanyards to carry keys, a knife or other small frequently used tools. Attach the lanyard to your belt loop and carry your keys or knife in your pocket. Just grab the lanyard and gently pull the keys from your pocket. You can also attach the lanyard to your field case or backpack. This greatly reduces the risk of leaving your keys, knife, or hand lens behind. The soft, supple leather easily tucks into one of the pockets of your pack.